Descended in the Sargent family to Martha Gertrude Farner Cork (great-granddaughter of Martha [Patty] Hills Sargent, the mother in the portrait, and granddaughter of Martha [Patty] Hills Sargent [later Mrs. Jehiel Smith], the child holding her father's hand), Waukesha, Wisconsin; given to her granddaughter, Gertrude Louise Cork Swezey, Coxsackie, New York, sometime before 17 June 1941. Purchased in 1953, possibly with (Thurston Thacher, Hyde Park, New York) as agent, by Edgar William and Bernice Chrysler Garbisch; gift to NGA, 1953. According to an affidavit of that date, signed by Mrs. Cork (who was ninety-seven years of age at that time), in NGA curatorial files. American Primitive Painting from the Collection of Edgar William and Bernice Chrysler Garbisch, Part I, National Gallery of Art, Washington, 1954, no. 32. American Primitive Pantings, National Gallery of Art, Washington, D.C., 1955. American Primitive Art, Museum of Fine Arts, Houston, 1956, no. 28. American Primitive Paintings from the Collection of Edgar William and Bernice Chrysler Garbisch, Part II, National Gallery of Art, Washington, 1957. 101 Masterpieces of American Primitive Painting from the Collection of E.W. and B.C. Garbisch, traveling exh. by the Amer. Federation of Arts, New York, 1961-1964, no. 33, color repro. First venue: The Metropolitan Musuem of Art, N.Y.
American Naive Painting of the 18th and 19th Centuries: 111 Masterpieces from the Collection of E.W. and B.C. Garbisch, traveling exh. by Amer. Fed. of Arts, N.Y., 1968-1970, no. 31, repro. First venue: Grand Palais, Paris. The New World: 1620-1970, Chrysler Art Museum, Provincetown, Massachusetts, 1970, no. 7. Kaleidescope of American Painting, Eighteenth and Nineteenth Centuries, William Rockhill Nelson Gallery of Art and Mary Atkins Museum of Fine Arts, Kansas City Missouri 1977-1978, no. 18. Small Folk: A Celebration of Childhood in America, organized by Museum of American Folk Art, NGA loans shown at The New-York Historical Society, New York, 1980-1981, 51, no. 109, color repro. (cat. by Sandra Brant and Elissa Cullman). American Naive Paintings from the National Gallery of Art, Terra Museum of American Art, Evanston, Illinois, 1981-1982, no. 5. New and Different: Domestic Interiors in Eighteenth-Century America, National Museum of American History, Smithsonian Institution, Washington, 1986-1987, no cat. Extended loan for use by Secretary Richard Riley, U.S. Department of Education, Washington, D.C., 1994-2000. American Fancy: Exuberance in the Arts, 1790-1840, Milwaukee Art Museum; Peabody Essex Museum, Salem; Maryland Historical Society, Baltimore, 2004-2005, not in cat. Samuel McIntire: Carving an American Style, Peabody Essex Museum, Salem, 2007-2008, unnumbered catalogue, fig. 5-80, as The Sargent Family of Charlestown, Massachusetts. Little, Nina Fletcher. "An Approach to Furnishing." Antiques 69-70 (July 1956): 45. Bouton, Margaret. American Painting in the National Gallery of Art. Washington, D.C., 1959 (Booklet Number One in Ten Schools of Painting in the National Gallery of Art, Washington, D.C.): 12, color repro. Little, Nina Fletcher. "The Conversation Piece in Folk Art." Antiques 67 (November 1968): 746, fig. 11. McClinton, Katherine Morrison. "American Furniture in Family Portraits." Apollo 89 (March 1969): 226-227. Bihalji-Merin, Oto. Masters of Naive Art. New York, 1971: color repro., 47. Peterson, Harold L. Americans at Home. New York, 1971: color pl. 14. King, Marian. Adventures in Art: National Gallery of Art, Washington, D.C. New York, 1978: 71, pl. 42. American Paintings: An Illustrated Catalogue. National Gallery of Art, Washington, 1980: 296, repro. Mayhew, Edgar de N., and Minor Myers, Jr. A Documentary History of American Interiors from the Colonial Era to 1915. New York, 1980: color pl. 6. Walker, John. National Gallery of Art, Washington. Rev. ed. New York, 1984: 538, no. 813, color repro. Gere, Charlotte. Nineteenth-Century Decoration: The Art of the Interior. London, 1989: 139, color pl. 149. Garrett, Elisabeth Donaghy. 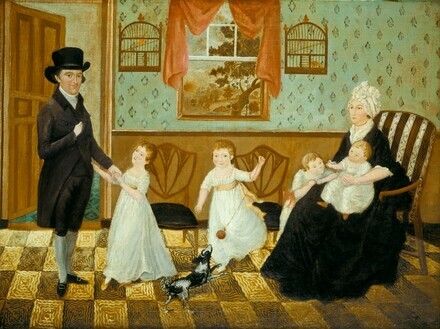 At Home: The American Family 1750-1870. New York, 1990: color repro. 74. Chotner, Deborah, with contributions by Julie Aronson, Sarah D. Cash, and Laurie Weitzenkorn. American Naive Paintings. The Collections of the National Gallery of Art Systematic Catalogue. Washington, D.C., 1992: 588-590, color repro. 589. Lahikainen, Dean T. "A McIntire Restoration: The East Parlor in the Peirce-Nichols House, Salem, Massachusetts." Antiques (December 2007): 87, fig. 18.